Disclaimer: The "facts" described here have been obtained from secondary sources--books whose authors have themselves interpreted other sources. The speculations have no supporting evidence but seem plausible to me, based on what I believe to be true of the history. And as my understanding changes with more reading, so does my level of confidence in these speculations. Pictures of Troy in 2000 AD are here. According to Homer's Illiad, the cause of the Trojan War went back to the Judgment of Paris. Paris, the Prince of Troy, was aksed to judge among three goddesses who was the most beautiful. For choosing Aphrodite, he was given as a prize the most beautiful human woman in the world. Unfortunately, that woman happened to be married to the King of Sparta, and when she fell in love with Paris and eloped with him to Troy, it was taken as a deadly insult, requiring the combined forces of the whole of the Myvcenean Peloponese (and perhaps beyond) to attack the city-state of Troy. After astalemated ten-year siege, the Greeks devised a stratagem. They built a huge wooden horse, and at night filled it with soldiers, and then withdrew thier armies. The Trojans saw that they had left, and took the horse to be a parting gift from the defeated enemy. They took the horse into the city, and at night the soldiers left the horse and opened the city gates, letting in the main army who destroyed the city with the usual rapine and pillage. Does this story make any sense? Even in those days, it seems a bit excessive to wage an indecisive 10-year war involving a confederation of states (even including places as far away as Crete) just to avenge a stolen wife! Homer wrote the Illiad (and the Odyssey) from stories handed down in the bardic tradition some 600 years after the war is supposed to have taken place. That is about the time that separates us from the beginning of the Renaissance, and how accurate are our impressions of life then? How accurately do we know the political intrigues among the city-states of that time? We have a considerable literature to let us know how life was, and what happened then. Homer had none. He had only a heroic bardic tradition, and moreover, a tradition that had been handed down through a period known as "the Aegean Dark Ages". A better analogy to what Homer knew of the time of the Trojan War would be what Chaucer might have known of the Roman Empire, or of the warrior-chief we call "King Arthur" who we know from stories written following an oral history. What Homer knew had come down to him in precise verses. The verse form and the redundancies of repetitious phrasing tend to maintain accuracy of wording, so we may believe that Homer wrote more or less what the original bards sang, though he did change the language to fit written rather than oral forms. But we do not need to believe that the original bards were even as accurate as contemporary TV reporters. The job of the bard was to make heroic propaganda, not to create a historical record. If a good story fitted with another good story that happened elswhere and at another time, what's the harm in a bard fitting them together to create a good night's entertainment around the fireside? Schliemann believed Homer's records were historical, and by so believing, he really found Troy. According to Chadwick, Homer also used correct Mycenian Greek name forms, without introducing anachronistic modern names. It was Chadwick's understanding of Ancient Greek that helped Michael Ventris decode Linear B, and it has been Chadwick's subsequent work with the Linear B tablets that has led to much of our knowledge of Mycenian Greece. It is Mycenean Greece that we are dealing with, if there was a Trojan War. So, if Chadwick says there is historical verisimilitude in particular details of what Homer wrote, we should believe that it is quite possible, even probable, that many of the events recounted actually happened. But we do not have to believe they happened with the timing, or even in the sequence in which Homer recounts them. And the most mysterious event of all, the Trojan Horse--could it have happened they way it is recounted? It seems most unlikely that warriors who had held of the united power of the Mycenian city-states for 10 years woudl have fallen for such a trick. Something must have happened to lead to such a story, but what? (More about the historical accuracy of Homer is here). Map showing how Troy controlled the Black Sea trade routes. The blue star-shape shows roughly the area devastated by the 1999 Izmit earthquake. 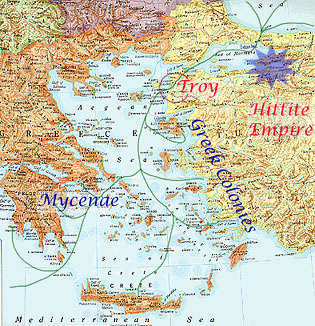 At the reputed time of the Trojan War, the Mycenean Greeks may have been been establishing a series of colonies along what is now the Turkish Aegean coast. At least there is evidence of such a colony at Miletus. At the same time, the Hittite Empire in central Anatolia was expanding, though there was a buffer region called Arzawa inland from the soutwest coast, and many of the coastal regions formed independent states. There was diplomatic correspondence between the Hittites and the Myceneans, addressed to the Mycenean "Great King," which suggests that one of the city states had the lead position among the Myceneans. Perhaps it was Mycenae itself, and the Great King was Agamemnon. The north of Anatolia, which was not Hittite territory, has some mineral wealth. According to another legend, Jason sought the Golden Fleece in Colchis (modern Georgia). One way of extracting gold, like our modern panning, was to drag a sheepskin--a fleece--through the gold-bearing sand of the river. The gold stuck to the fleece, creating a golden fleece. Recent archaelogical discoveries suggest that Jason's Mycenean Iolkos was in Thessaly , the part of Mycenean Greece nearest the Dardanelles, and thus a place likely to have traded through the Dardanelles (Toronto Star, July 28, 2001). The area of northern Turkey or Georgia may also figure in the legend of King Midas, though he lived about 400 years later. There was probably quite a lot of opportunity for Mycenean trade, not only with Georgia and the north coast of Anatolia, but also with what is now the Ukraine and other areas bordering on the Black Sea. For the Myceneans, such sea trade might have been easier than relying on caravans through Hittite territory, where they might be subject to both official and unofficial interception. 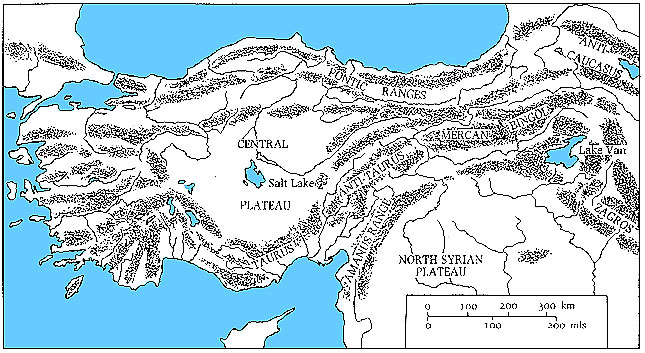 Furthermore, the terrain is not always easy in Anatolia, as this map suggests. To get to the Black Sea, one must pass through two very narrow straits, one at each end of the Sea of Marmara. Troy sat right at the end of the Dardanelles, in a perfect position to allow Trojan ships to stop any solo cargo ship that might have wanted passage. If they did allow passage, they might well have demanded customs duties (in kind, since the Myceneans apparently did not use currency in the way the Eblaite traders had done 1500 years earlier). On the other hand, Seton Lloyd says that there is no evidence that Troy had a fleet. I think it would be a bit surprising for a fortified city in such a location, and with a good harbour, not to have had at least some warships, whether archaeologists now can find direct evidence of them or not. All these considerations lead to the notion that over the years, tensions might have been building between the Mycenean maritime states and Troy, and that the idea of a combined expedition to reduce Troy to the status of a Mycenean colony had been brewing for some time. All that would have been needed would be an incident that would suggest to the various city-states that the moment had come. The seduction of Helen by Paris could have provided the trigger. However, if Paris, the Prince of Troy, was a guest in Sparta, relations must have been at least diplomatically correct, if not friendly, at the time. One would not have expected that the expedition was in preparation when he arrived, unless the diplomacy was as duplicitous as it often is nowadays. And if the expedition was being prepared, and Paris discovered it, might that not be a sufficient reason for him to flee Sparta secretly to avoid possible assassination? Taking Helen along might have been just a lucky opportunity, as far as he was concerned. Or it may never have happened, and the Helen story could be as accurate as some of the political cover stories of our own era. My surmise is that the Trojan War did happen, and that it was a straight commercial fight for access to the Black Sea trade. The romantic stories about Helen and Paris are just that--romantic stories. The events may or may not have happened, but they did not generate the war. This horse is no more absurd than the story about it, I think. 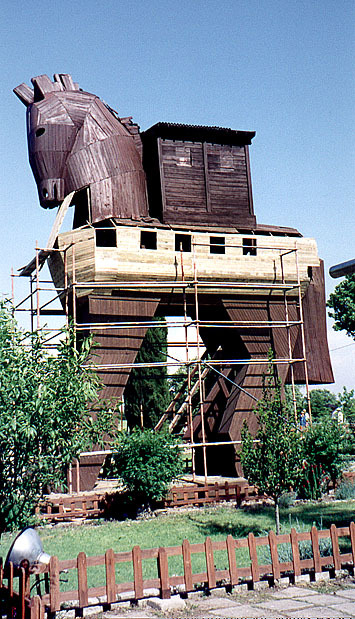 In my view, the story of the Trojan Horse, if taken literally, is absurd. It just might be physically possible, though having seen the conformation of the entrance to Homeric Troy, even that is dubious. To get a wooden room having a capacity for even two or three soldiers around the narrow turns leading to the main gate would have been very awkward. Even if the Trojans had thought the horse to be a gift from the departing Greeks, they would have examined it seriously outside the walls before going to the considerable trouble of negotiating it into the city. And there is no evidence that the Trojan leadership was stupid, which creates another problem with the story. If they had been that stupid, they would never have been able to withstand a long siege in the first place. There is, however, a perfectly natural explanation, which was mentioned by our guide on the tour, Ahmet Is.c.imen.The archaeological evidence suggests that the walls of Homeric Troy were destroyed by earthquake--or at least, if it wasn't Homeric Troy, it was a phase of Troy when it was at its height of magnificence, when it looked much as Homer says it did. Poseidon, in both classical and Mycenian times was the god not only of the sea, but also of earthquakes. The ancients would almost certainly have said that Poseidon toppled the walls, rather than that a natural force did. Such sporadic events could not be natural; some god or other must cause them. Poseidon was also the god of horses, and the horse was his symbol. It is not unreasonable to suppose that an early version of the story said something like "A great horse delivered the city to the Greeks," meaning Poseidon delivered the city into their hands. How would a later bard interpret that? It makes no sense as is, and would need elaboration. It is no great stretch of the imagination to see an elaboration in which the Greeks, as the heros of the story and the ancestors of the listeners, were said to have constructed the great horse, rather than that Poseidon himself was the great horse. And how could making such a horse allow the Greeks to take the city? It could hardly serve as a battering ram. Even though filling it with soldiers and leaving the "gift" to the Trojans while appearing to retire is hardly a plausible story, such a stratagem might seem ingenious and would seem at least physically possible to a bard who had never seen Troy. The eventual story makes the Greeks look good, and allows them to look down their noses at the stupidity of those Trojans, and accounts for the "great horse." Is this construal correct? Who can tell? The destruction of Troy occurred very shortly before the Mycenean cities fell one after the other to some mysterious raiders, probably from the sea in the case of Pylos, at least, and maybe also in the case of the other cities. Greece fell into what is known as the "Greek Dark Ages" for several hundred years. Literacy effectively vanished, the population dispersed, and there were no great cities until the recovery that led to the Classical period of which Periclean Athens was the high point. 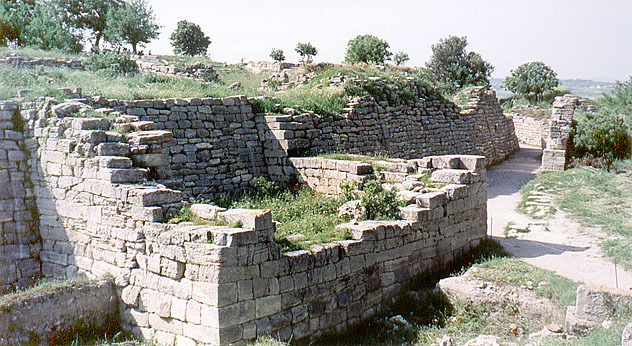 The timing of the destruction of the Mycenean cities is so close to that of the magnificant city of Troy that some have wondered whether maybe the Trojan destruction was at the same hands as the Mycenean destruction, rather than at the hands of the Myceneans. This may be true, but there is another possibility. If the Trojan War was such a major expedition for the Myceneans as the Iliad makes it out to be--a multi-state coalition involving most of the military--the war must have weakened the Myceneans economically as well as militarily. If we are to believe some of the associated stories, the returning warriors often came back to discord at home. For example, Agamemnon was murdered by his wife, Ulysses faced many rivals for his throne, and so forth. Such weakened states might have been easy prey for invaders, whether they were Dorians from the north, the mysterious "Sea Peoples" or someone else. All we really know is that the Egyptians were fighting off the Sea Peoples, that Troy was destroyed (but apparently not occupied and administered by the Myceneans) and that the Mycenean cities were also destroyed. Most of the rest is speculation.